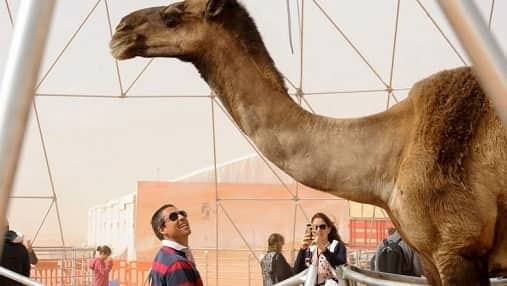 The tallest camel in the world is in Saudi Arabia's Riyadh now in the Camel Beauty Pageant, King Abdulaziz Camel Festival, This camel is 3 meters taller (300cm) than the present tallest camel (190cm) in the world. This eight year old camel belongs to Sultan Al Rashidi in Hail, It is one of its own kind as the other two are not that much taller as this camel is. Some one in the festival is tried to buy it for 300,000 Saudi Riyals. - Camel festival supervisor is in touch with Guinness record people and the status of it is in preliminary stage, once it approved, the camel can be checked to see if there is any other competition to it to become world's tallest camel. - The owner of the camel already got an offer to sell it for 300,000 SR, However the price will go up as it has been registered in Guinness world record, A team from them is examining the camel.